Why, A Medley of Potpourri is just what it says; various thoughts, opinions, ruminations, and contemplations on a variety of subjects. More probability density is found as one gets closer to the expected (mean) value in a normal distribution. Statistics used in standardized testing assessment are shown. The scales include standard deviations, cumulative percentages, percentile equivalents, Z-scores, T-scores, standard nines, and percentages in standard nines. Statistics is the study of the collection, analysis, interpretation, presentation, and organization of data. In applying statistics to, e.g., a scientific, industrial, or societal problem, it is necessary to begin with a population or process to be studied. Populations can be diverse topics such as "all persons living in a country" or "every atom composing a crystal". It deals with all aspects of data including the planning of data collection in terms of the design of surveys and experiments. In case census data cannot be collected, statisticians collect data by developing specific experiment designs and survey samples. Representative sampling assures that inferences and conclusions can safely extend from the sample to the population as a whole. An experimental study involves taking measurements of the system under study, manipulating the system, and then taking additional measurements using the same procedure to determine if the manipulation has modified the values of the measurements. In contrast, an observational study does not involve experimental manipulation. Two main statistical methodologies are used in data analysis: descriptive statistics, which summarizes data from a sample using indexes such as the mean or standard deviation, and inferential statistics, which draws conclusions from data that are subject to random variation (e.g., observational errors, sampling variation). 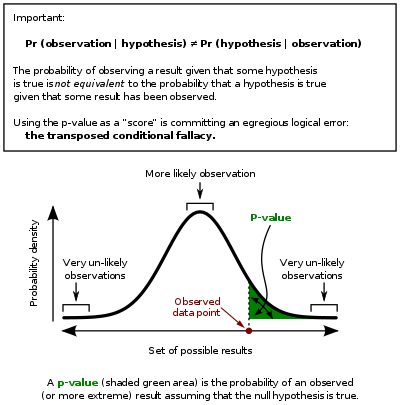 Descriptive statistics are most often concerned with two sets of properties of a distribution (sample or population): central tendency (or location) seeks to characterize the distribution's central or typical value, while dispersion (or variability) characterizes the extent to which members of the distribution depart from its center and each other. Inferences on mathematical statistics are made under the framework of probability theory, which deals with the analysis of random phenomena. To make an inference upon unknown quantities, one or more estimators are evaluated using the sample. Standard statistical procedure involve the development of a null hypothesis, a general statement or default position that there is no relationship between two quantities. Rejecting or disproving the null hypothesis is a central task in the modern practice of science, and gives a precise sense in which a claim is capable of being proven false. What statisticians call an alternative hypothesis is simply an hypothesis that contradicts the null hypothesis. Working from a null hypothesis two basic forms of error are recognized: Type I errors (null hypothesis is falsely rejected giving a "false positive") and Type II errors (null hypothesis fails to be rejected and an actual difference between populations is missed giving a "false negative"). A critical region is the set of values of the estimator that leads to refuting the null hypothesis. The probability of type I error is therefore the probability that the estimator belongs to the critical region given that null hypothesis is true (statistical significance) and the probability of type II error is the probability that the estimator doesn't belong to the critical region given that the alternative hypothesis is true. The statistical power of a test is the probability that it correctly rejects the null hypothesis when the null hypothesis is false. Multiple problems have come to be associated with this framework: ranging from obtaining a sufficient sample size to specifying an adequate null hypothesis. Measurement processes that generate statistical data are also subject to error. Many of these errors are classified as random (noise) or systematic (bias), but other important types of errors (e.g., blunder, such as when an analyst reports incorrect units) can also be important. The presence of missing data and/or censoring may result in biased estimates and specific techniques have been developed to address these problems. Confidence intervals allow statisticians to express how closely the sample estimate matches the true value in the whole population. Formally, a 95% confidence interval for a value is a range where, if the sampling and analysis were repeated under the same conditions (yielding a different dataset), the interval would include the true (population) value in 95% of all possible cases. In statistics, dependence is any statistical relationship between two random variables or two sets of data. Correlation refers to any of a broad class of statistical relationships involving dependence. If two variables are correlated, they may or may not be the cause of one another. The correlation phenomena could be caused by a third, previously unconsidered phenomenon, called a lurking variable or confounding variable. Statistics can be said to have begun in ancient civilization, going back at least to the 5th century BC, but it was not until the 18th century that it started to draw more heavily from calculus and probability theory. Statistics continues to be an area of active research, for example on the problem of how to analyze Big data. Mathematical statistics is the application of mathematics to statistics, which was originally conceived as the science of the state — the collection and analysis of facts about a country: its economy, land, military, population, and so forth. Mathematical techniques used for this include mathematical analysis, linear algebra, stochastic analysis, differential equations, and measure-theoretic probability theory. In applying statistics to e.g. a scientific, industrial, or societal problem, it is necessary to begin with a population or process to be studied. Populations can be diverse topics such as "all persons living in a country" or "every atom composing a crystal". When a census is not feasible, a chosen subset of the population called a sample is studied. Once a sample that is representative of the population is determined, data is collected for the sample members in an observational or experimental setting. Again, descriptive statistics can be used to summarize the sample data. However, the drawing of the sample has been subject to an element of randomness, hence the established numerical descriptors from the sample are also due to uncertainty. To still draw meaningful conclusions about the entire population, inferential statistics is needed. It uses patterns in the sample data to draw inferences about the population represented, accounting for randomness. These inferences may take the form of: answering yes/no questions about the data (hypothesis testing), estimating numerical characteristics of the data (estimation), describing associations within the data (correlation) and modeling relationships within the data (for example, using regression analysis). Inference can extend to forecasting, prediction and estimation of unobserved values either in or associated with the population being studied; it can include extrapolation and interpolation of time series or spatial data, and can also include data mining. In case census data cannot be collected, statisticians collect data by developing specific experiment designs and survey samples. Statistics itself also provides tools for prediction and forecasting the use of data through statistical models. To use a sample as a guide to an entire population, it is important that it truly represent the overall population. Representative sampling assures that inferences and conclusions can safely extend from the sample to the population as a whole. A major problem lies in determining the extent that the sample chosen is actually representative. Statistics offers methods to estimate and correct for any random trending within the sample and data collection procedures. There are also methods of experimental design for experiments that can lessen these issues at the outset of a study, strengthening its capability to discern truths about the population. Sampling theory is part of the mathematical discipline of probability theory. Probability is used in "mathematical statistics" (alternatively, "statistical theory") to study the sampling distributions of sample statistics and, more generally, the properties of statistical procedures. The use of any statistical method is valid when the system or population under consideration satisfies the assumptions of the method. The difference in point of view between classic probability theory and sampling theory is, roughly, that probability theory starts from the given parameters of a total population to deduce probabilities that pertain to samples. Statistical inference, however, moves in the opposite direction—inductively inferring from samples to the parameters of a larger or total population. A common goal for a statistical research project is to investigate causality, and in particular to draw a conclusion on the effect of changes in the values of predictors or independent variables on dependent variables or response. There are two major types of causal statistical studies: experimental studies and observational studies. In both types of studies, the effect of differences of an independent variable (or variables) on the behavior of the dependent variable are observed. The difference between the two types lies in how the study is actually conducted. Each can be very effective. An experimental study involves taking measurements of the system under study, manipulating the system, and then taking additional measurements using the same procedure to determine if the manipulation has modified the values of the measurements. In contrast, an observational study does not involve experimental manipulation. Instead, data are gathered and correlations between predictors and response are investigated. While the tools of data analysis work best on data from randomized studies, they are also applied to other kinds of data – like natural experiments and observational studies – for which a statistician would use a modified, more structured estimation method (e.g., Difference in differences estimation and instrumental variables, among many others) that produce consistent estimators. Design of experiments, using blocking to reduce the influence of confounding variables, and randomized assignment of treatments to subjects to allow unbiased estimates of treatment effects and experimental error. At this stage, the experimenters and statisticians write the experimental protocol that shall guide the performance of the experiment and that specifies the primary analysis of the experimental data. An example of an observational study is one that explores the correlation between smoking and lung cancer. This type of study typically uses a survey to collect observations about the area of interest and then performs statistical analysis. In this case, the researchers would collect observations of both smokers and non-smokers, perhaps through a case-control study, and then look for the number of cases of lung cancer in each group. Various attempts have been made to produce a taxonomy of levels of measurement. The psychophysicist Stanley Smith Stevens defined nominal, ordinal, interval, and ratio scales. Nominal measurements do not have meaningful rank order among values, and permit any one-to-one transformation. Ordinal measurements have imprecise differences between consecutive values, but have a meaningful order to those values, and permit any order-preserving transformation. Interval measurements have meaningful distances between measurements defined, but the zero value is arbitrary (as in the case with longitude and temperature measurements in Celsius or Fahrenheit), and permit any linear transformation. Ratio measurements have both a meaningful zero value and the distances between different measurements defined, and permit any rescaling transformation. 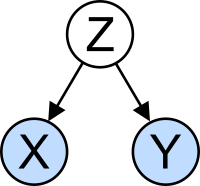 Consider an independent identically distributed (iid) random variables with a given probability distribution: standard statistical inference and estimation theory defines a random sample as the random vector given by the column vector of these iid variables. The population being examined is described by a probability distribution that may have unknown parameters. Interpretation of statistical information can often involve the development of a null hypothesis in that the assumption is that whatever is proposed as a cause has no effect on the variable being measured. The best illustration for a novice is the predicament encountered by a jury trial. The null hypothesis, H0, asserts that the defendant is innocent, whereas the alternative hypothesis, H1, asserts that the defendant is guilty. The indictment comes because of suspicion of the guilt. The H0 (status quo) stands in opposition to H1 and is maintained unless H1 is supported by evidence "beyond a reasonable doubt". However, "failure to reject H0" in this case does not imply innocence, but merely that the evidence was insufficient to convict. So the jury does not necessarily accept H0 but fails to reject H0. While one can not "prove" a null hypothesis, one can test how close it is to being true with a power test, which tests for type II errors. What statisticians call an alternative hypothesis is simply an hypothesis that contradicts the null hypothesis. Many statistical methods seek to minimize the residual sum of squares, and these are called "methods of least squares" in contrast to Least absolute deviations. The later gives equal weight to small and big errors, while the former gives more weight to large errors. Residual sum of squares is also differentiable, which provides a handy property for doing regression. 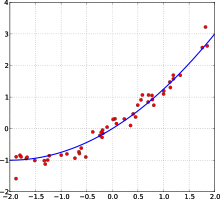 Least squares applied to linear regression is called ordinary least squares method and least squares applied to nonlinear regression is called non-linear least squares. Also in a linear regression model the non deterministic part of the model is called error term, disturbance or more simply noise. Measurement processes that generate statistical data are also subject to error. Many of these errors are classified as random (noise) or systematic (bias), but other important types of errors (e.g., blunder, such as when an analyst reports incorrect units) can also be important. The presence of missing data and/or censoring may result in biased estimates and specific techniques have been developed to address these problems. While in principle the acceptable level of statistical significance may be subject to debate, the p-value is the smallest significance level that allows the test to reject the null hypothesis. This is logically equivalent to saying that the p-value is the probability, assuming the null hypothesis is true, of observing a result at least as extreme as the test statistic. Therefore the smaller the p-value, the lower the probability of committing type I error. A difference that is highly statistically significant can still be of no practical significance, but it is possible to properly formulate tests in account for this. One response involves going beyond reporting only the significance level to include the p-value when reporting whether a hypothesis is rejected or accepted. The p-value, however, does not indicate the size or importance of the observed effect and can also seem to exaggerate the importance of minor differences in large studies. A better and increasingly common approach is to report confidence intervals. Although these are produced from the same calculations as those of hypothesis tests or p-values, they describe both the size of the effect and the uncertainty surrounding it. Fallacy of the transposed conditional, aka prosecutor's fallacy: criticisms arise because the hypothesis testing approach forces one hypothesis (the null hypothesis) to be favored, since what is being evaluated is probability of the observed result given the null hypothesis and not probability of the null hypothesis given the observed result. An alternative to this approach is offered by Bayesian inference, although it requires establishing a prior probability. As everything in inferential statistics it relies on sample size, and therefore under fat tails p-values may be seriously mis-computed. The concept of correlation is particularly noteworthy for the potential confusion it can cause. Blaise Pascal, an early pioneer on the mathematics of probability. Statistical methods date back at least to the 5th century BC. Its mathematical foundations were laid in the 17th century with the development of the probability theory by Blaise Pascal and Pierre de Fermat. Mathematical probability theory arose from the study of games of chance, although the concept of probability was already examined in medieval law and by philosophers such as Juan Caramuel. The method of least squares was first described by Adrien-Marie Legendre in 1805. The modern field of statistics emerged in the late 19th and early 20th century in three stages. The first wave, at the turn of the century, was led by the work of Sir Francis Galton and Karl Pearson, who transformed statistics into a rigorous mathematical discipline used for analysis, not just in science, but in industry and politics as well. Galton's contributions to the field included introducing the concepts of standard deviation, correlation, regression and the application of these methods to the study of the variety of human characteristics – height, weight, eyelash length among others. Pearson developed the Correlation coefficient, defined as a product-moment, the method of moments for the fitting of distributions to samples and the Pearson's system of continuous curves, among many other things. Galton and Pearson founded Biometrika as the first journal of mathematical statistics and biometry, and the latter founded the world's first university statistics department at University College London. Ronald Fisher coined the term "null hypothesis". The second wave of the 1910s and 20s was initiated by William Gosset, and reached its culmination in the insights of Sir Ronald Fisher, who wrote the textbooks that were to define the academic discipline in universities around the world. Fisher's most important publications were his 1916 seminal paper The Correlation between Relatives on the Supposition of Mendelian Inheritance and his classic 1925 work Statistical Methods for Research Workers. His paper was the first to use the statistical term, variance. He developed rigorous experimental models and also originated the concepts of sufficiency, ancillary statistics, Fisher's linear discriminator and Fisher information. "Applied statistics" comprises descriptive statistics and the application of inferential statistics. [verification needed] Theoretical statistics concerns both the logical arguments underlying justification of approaches to statistical inference, as well encompassing mathematical statistics. Mathematical statistics includes not only the manipulation of probability distributions necessary for deriving results related to methods of estimation and inference, but also various aspects of computational statistics and the design of experiments. There are two applications for machine learning and data mining: data management and data analysis. Statistics tools are necessary for the data analysis. Increased computing power has also led to the growing popularity of computationally intensive methods based on resampling, such as permutation tests and the bootstrap, while techniques such as Gibbs sampling have made use of Bayesian models more feasible. The computer revolution has implications for the future of statistics with new emphasis on "experimental" and "empirical" statistics. A large number of both general and special purpose statistical software are now available. Traditionally, statistics was concerned with drawing inferences using a semi-standardized methodology that was "required learning" in most sciences. This has changed with use of statistics in non-inferential contexts. What was once considered a dry subject, taken in many fields as a degree-requirement, is now viewed enthusiastically. [according to whom?] Initially derided by some mathematical purists, it is now considered essential methodology in certain areas.